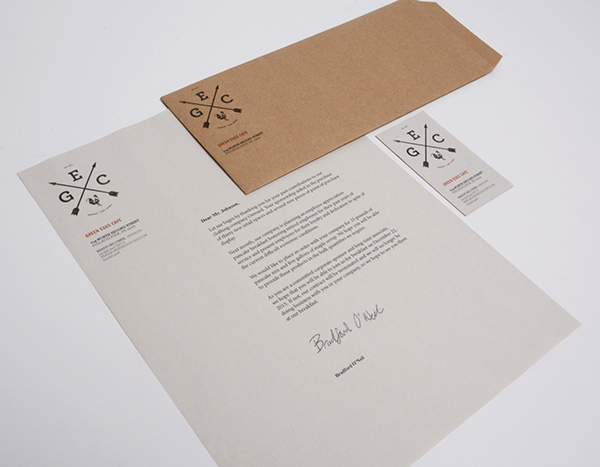 Stationary system includes letterhead, envelope, and business card. 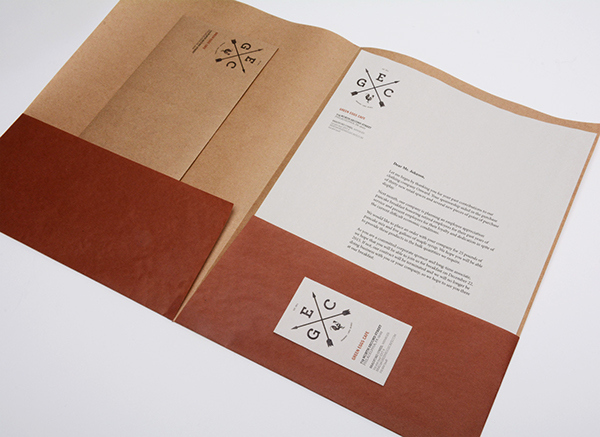 Both letterhead and business cards are printed on newspaper, and the envelope is made of kraft paper, hinting at Green Eggs Cafe being eco-friendly. Folder that can hold envelopes, letterheads and other documents, as well as business cards. Menu includes both breakfast and lunch as well as speciality items. 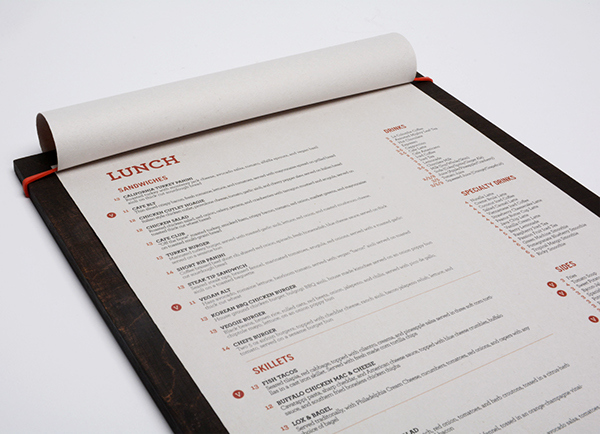 The menu is printed on newsprint refering back to Green Eggs Cafe being eco-friendly, and sits on recycled wood. Green Eggs Cafe is a cafe located in Philadelphia that serves breakfast, brunch, and lunch. Green Eggs Cafe targets a hipper and younger demographic, but encourages all to eat at its restaurant. The "green" in Green Eggs Cafe refers to the cafe's dedication to buying from local farms and using no plastic or other harmful products in their restaurant and packaging. 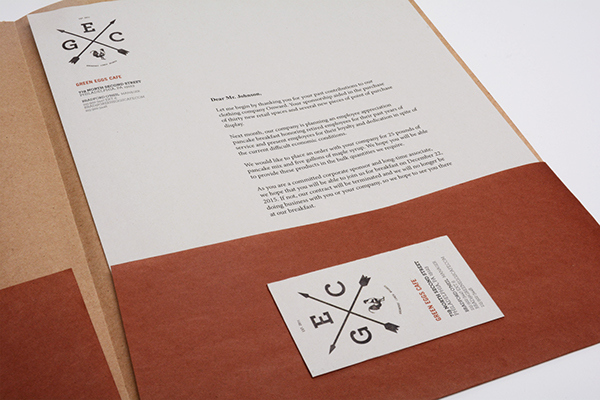 Green Eggs Cafe current identity focused on illustrative grass and egg shaped business cards. Although playful, this did not seem appropriate to the ideals Green Eggs Cafe believes in. After researching vintage farm vernacular, I became aware that this approach was needed to communicate what Green Eggs Cafe is as a restaurant and brand. The logo is made up of multiple parts, the abstract adaptation of a wind-vein, the restaurants name, and a chicken, focusing on the "egg" part of their name. 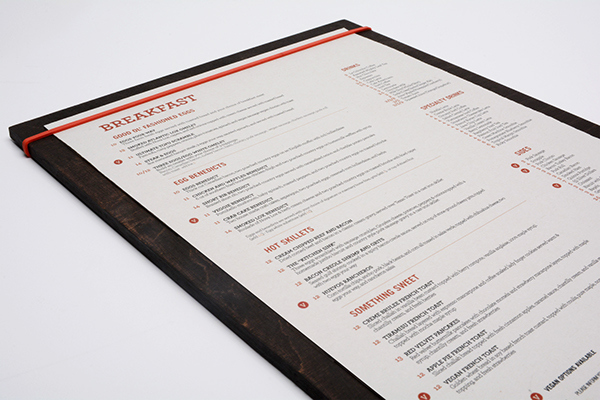 Using craft paper, newsprint paper, and wood creates a texture that connects customer's to Green Eggs Cafe's stance on being farm fresh. The color red is used as small pops of color on the menu to separate food categories as well as pricing and vegan options.